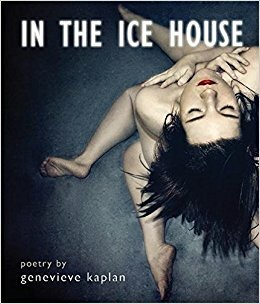 AUTHOR OF POETRY "IN THE ICE HOUSE"
Award-winning poet, Genevieve Kaplan, coordinates the Kingsley & Kate Tufts Poetry Awards at Claremont Graduate University, works as an occasional adjunct professor in creative writing, and publishes contemporary translations of poetry and prose through the Toad Press International chapbook series. Her first book of poetry In the ice house won the 2009 A Room of Her Own Foundation’s To the Lighthouse prize and was published by Red Hen Press in 2011. She is also the author of three chapbooks: settings for these scenes (Convulsive Editions), In an aviary (Grey Book Press), and Travelogue (Dancing Girl Press). Her poems, essays, and reviews have appeared in a variety of journals, including Western Humanities Review, Jacket, Jubilat, Galatea Resurrects, Sugar House Review, Denver Quarterly, Gulf Coast, Copper Nickel, Fence, Northwest Review, Rhino, and Yew: A Journal of Innovative Writing and Image. Jodie: How did your interest in writing poetry first develop? Genevieve: I’ve always loved writing and thinking about writing, but I did have a singular experience with language early on. When I was in 2nd or 3rd grade, all my friends were getting their ears pierced. Of course, I wanted to get mine pierced too and wearing earrings was all I could think about. One day my friend came to school wearing round, luminescent pearl-ish earrings and I remember thinking to myself: “nestled” – lovely. The word was so perfect, and it captured what I felt: not just that the earrings were like eggs and her lobes were nests, but that her body was hugging or caring for these earrings in a way that seemed beautiful and primal and that I was envious of. That was my first moment of consciously thinking about what words could do, of realizing that by being open to metaphorical language I could maybe do magical things. Jodie: As a graduate of the highly esteemed creative writing program at the University of Iowa, what were the three most valuable things you learned there? Genevieve: Iowa was a new place in so many ways, and I essentially did nothing but learn there. It was in the Midwest, where I hadn’t lived before, so I learned about snow and cold and seasons and fireflies. It was an enormous graduate program, and I learned how many people wanted to study and write poetry, and how many different types of contemporary poetics were being practiced with great passion. I was teaching to defray tuition costs, and I learned how it felt to stand and speak in front of a group of 18-year-olds and to think about their needs instead of my needs. Overall, I learned a lot about what a writing community could be and how many different ways there were to participate in it; I met so many inspiring poets and writers—both professors and students—who were creating community and inviting others to join in. I learned to think about the poem beyond the page: the poem as a public practice, the poem as outreach, the poem as gift, the poem as invitation, the poem as a way to think and participate and contribute. Jodie: How did you decide to continue your education after the MFA degree and earn a PhD in creative writing and literature? What was that experience like? Genevieve: I taught as an adjunct for many years after completing my MFA, and the desire to go back for the PhD was born out of both wanting to find a permanent position as a professor and wanting to be able to spend time studying literature and reading deeply. My focus as a PhD student was on the connections between artists’ books and contemporary poetry, with a special interest in works of visual or literary erasure (like Jen Bervin’s Nets, or Janet Holmes’s THE MS OF M Y KIN). Partially I chose these visual, surface-y subjects because I was worried that if I spent too much time parsing and analyzing poems by writers that I loved that I’d bring that over-analytical gaze to my own work; that I might lose my desire to write at all. (In retrospect, I’m pretty sure that concern was unfounded.) Too, I tend to like to think more about subjects that disturb me a bit, and for poetry, I find the practice of writing by not-writing both disturbing and really intriguing. The PhD was certainly a time-consuming and rigorous undertaking, but it did allow me to wallow in literature: to immerse myself in the lives and works of poets and artists and books, and to challenge myself to see what I would make of all the new information—and beauty—that I found there. Jodie: It sounds like you live a very well-rounded literary life. What is your job like as coordinator of the Kingsley & Kate Tufts Poetry Awards at Claremont Graduate University? Genevieve: It has been fascinating! I’ve done other behind-the-scenes work as an editor and publisher and runner-of-reading-series, but learning more about what goes into running a prestigious national contest has been really interesting. The awards are presented each spring, but work goes on year round: in summer we receive awards submissions (publishers and authors send 8 copies of their published books for our judges to consider, which means that about 3,500 volumes of poetry arrive on campus every year), the Kingsley winner returns for a week-in-residence on campus in fall, judging takes place in fall and winter, the finalists and winners are announced and fêted in April, and then the whole cycle repeats itself. Plus, there are all the less outwardly exciting aspects of managing a prize to organize: advertising, social media, press, VIPs, etc. I’ve done a lot of proofreading; I’ve learned how to use Excel spreadsheets; I’ve gained a huge appreciation for event planners. Overall, I love how varied the job is – I’m not just sitting in an office every day, and when I am sitting in my office I’m literally surrounded by poetry (those 3,500+ books need to be shelved somewhere…). The job continually reminds me how necessary and alive poetry is, and how important it is that we are able to publicly recognize and value achievements in creative work. Jodie: Another aspect of your life in literature is Toad Press. How did that enterprise develop? Genevieve: After finishing up my MFA, I wanted to make sure to stay involved with the literary scene – and I had taken courses in book arts and publishing as an undergraduate and also while I was at Iowa – so starting a small press seemed like a brilliant idea. There were two immediate issues: I didn’t have any money, and I wanted to avoid starting a vanity press/ being nepotistic and publishing only my friends. So I hit upon chapbooks—handmade, inexpensive, easy to produce—and translation—I had read some brilliant poets in translation that excited me, and the writers participating in the International Writing Project at Iowa were creating work that seemed so different and compelling. Even better, at that point I didn’t know anyone well who was a practicing translator, so: no conflict of interest. ​I was also, of course, looking to see what I could contribute to contemporary literature with the press, to make sure the enterprise went beyond just a fun bookmaking hobby for me, and as far as I could tell, starting a chapbook-length translations press would mean filling a niche in the landscape. Happily, there are now quite a few presses and journals focused on translated work, that publish folios and shorter translation projects and chapbooks – it’s wonderful to think that Toad Press is now part of a larger coalition promoting and publishing contemporary literary translation. Jodie: Is it fair to say that you have a loving affinity for chapbooks—not only the writing but the physical presentation of books? When did you first begin making chapbooks? Genevieve: Absolutely! I love chapbooks so much that I sometimes feel like I should be embarrassed. I wrote and made books as a child, quite often. I had an alphabet stamp set that I used to print up little notes and rhymes, and I would write stories on patterned stationary and fold and staple them into booklets that I’d keep in shoeboxes. But it wasn’t until later on, in college, that I learned about the chapbook as a viable form / literary movement. I took letterpress classes at UC Santa Cruz and learned about folios and fine press printing, and in one of my creative writing courses there we created our own poetry chapbooks as a final project. I’ve always been delighted by the ease and ephemerality of the chapbook form; it’s so easy to make and so nice to share. So, I just kept right on, making little chapbooks of my own work, making chapbooks of my favorite poems, etc. It seemed very natural for me to later start the chapbook press, which allowed me to continue one of my favorite projects, but also to contribute to the literary landscape in a meaningful way. Jodie: “Any landscape quietly influences the patterns of our days,” you have said. Having lived in many landscapes from the Pacific Coast to the Midwest to the mountains and deserts of the West to the Los Angeles mega city, do you have a favorite landscape for poetic inspiration? Genevieve: I don’t know if I have a favorite landscape, but I do think all these places have left their mark on my poems. It takes a little while for a lived landscape to percolate through, I think. I found myself writing about the Midwest when I was living in Reno, and writing about the high desert landscapes of Reno and the eastern Sierras after I moved to southern California; I’m just now beginning to write poems that are clearly influenced by the small-town Los Angeles suburb that I’ve resided in for a little over a decade. I love the varieties of landscape I can find locally – from skyscrapers and graffiti and parking garages and freeways to coyotes and granite and chaparral and yucca – our area is really amazing in terms of access to different landscapes to view and experiences. I love the open-ended feeling of the horizons here. Jodie: Do you have a writing ritual, a daily practice you follow that helps you produce poems on a regular basis? Genevieve: There’s nothing for me that makes a poem come, no ritual that I can use to produce a wonderful poem, although I do like ritual. When I get stuck on an idea or a draft but don’t feel inspired I often turn to the physical form or activity to help inspire me. I like to handwrite lines and phrases on small strips of paper and move them around on the floor or on a page; I like to walk by myself and think the line in my head in time with my steps; I like to make little books and then see how a line or a poem might fit inside them. Jodie: Do you have any advice for students who want to make a literary life? Genevieve: There’s no one way to make a literary life – if you want to be a writer, you write. I do have a few suggestions: find—and participate in—a literary community that makes your work possible, perhaps by joining an in-person or online writing group, taking a course or seeking a degree, attending a reading series, volunteering or working for a press or journal or library or bookstore, starting your own any of the above. Read a lot of contemporary writing in books and literary journals; create time for yourself to write and think about your writing. Most of all, being a writer means prioritizing your own writing in whatever way that means for you: perhaps taking 15 minutes each day to write or revise or think about writing; sending yourself on an occasional weekend writing retreat or staycation. Ultimately it means making sure your day job—which most likely will not be “being a writer”— and your friends—hopefully some of whom will be writers or artists or creators—allow you the time and space and energy you need to write. Pasadena City College welcomes Genevieve Kaplan to speak to creative writing enthusiasts on November 16, 2017. Look for details in campus news sources.